In view of the 2019 European Parliament elections, the discussion about the Future of Europe is becoming more topical and higher to the public debate and agenda. In one of the largest democratic events in the world, over 413 million European citizens will have the opportunity to influence the future direction of the EU, while the European project faces important challenges. Citizens’ participation is considered a key factor of political equality in the EU and can prove impetus for Europe, in shaping the political priorities for the next 5 years and providing a more inclusive and positive future. 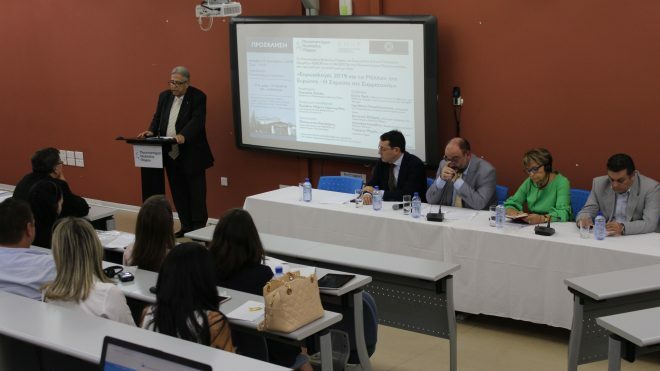 In this context, ENoP’s working group on The Future of Europe joined forces with the Neapolis University and the Centre of International and European Political Economy and Governance (CIEPEG) of the University of Peloponnese to organise a debate on the European Parliament Elections in 2019 with a special focus on the importance of citizen participation. 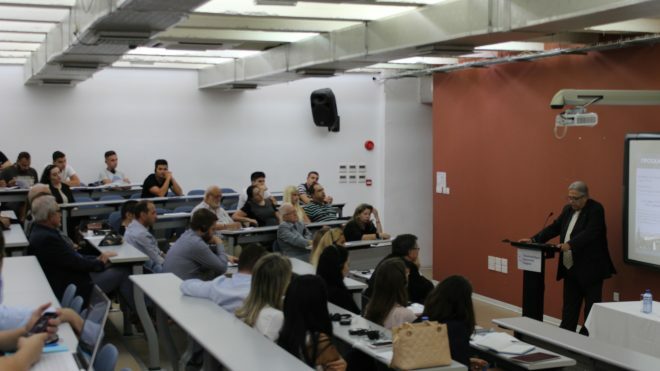 The conference took place at the Amphitheater of Neapolis University on 22 October 2018. 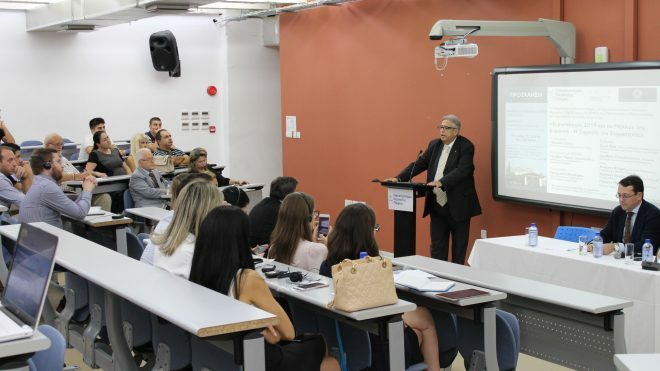 The Rector of Neapolis University, Professor Pantelis Sklias, gave the inaugural speech highlighting the importance of the forthcoming European elections for the future of Europe. Representing the Minister of Foreign Affairs Nikos Christodoulidis, Ambassador Marios Ieronimides, Deputy General Director of the Ministry of Foreign Affairs, addressed the event, mentioning the historical development of the European integration and underlining the importance of the participation of Cyprus in the European Union. George Maris, Lecturer at Neapolis University Pafos. In her opening welcome speech Alina Garkova, Policy and Liaison Manager of ENoP, highlighted the importance of networks such as ENoP that provide space for pluralistic political dialogue. The interactive debate was moderated by Panagiotis Kakolyris, journalist and Senior Researcher at CIEPEG and touched upon the aspects such as the rise of nationalism and populism as well as the different possibilites to increase the participation at the European elections. Credits and further information: See press release of the Neapolis University Pafos.